Take one of the most famous Spanish cocktails and give it a Hawaiian Shaved Ice upgrade. What do you get? Amazingly true-tasting sangria flavored snow cones! Sangrias have a distinct combination of flavors that give it a character. 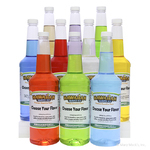 They have the acidity of wine, the sweetness of fruit, and the fizziness of a soda. Our sangria snow cone syrup looks and tastes just like the famous cocktail, but without the alcohol, making it safe for the whole family. 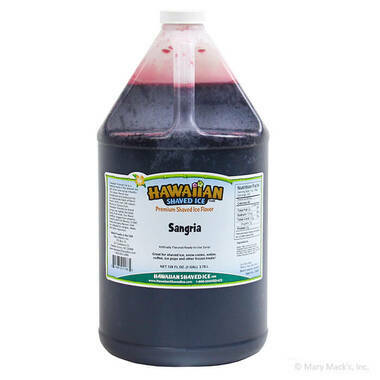 If you want to make a splash at your upcoming party and get the conversation started, just pour some satisfying sangria syrup over shaved ice and snow cones! 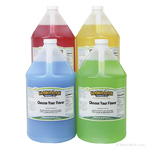 With a gallon-sized container, you�ll rest easy knowing that you have plenty in store for your next occasion. Once you sample some, you�ll have a hard time believing that it�s not an actual glass of sangria! 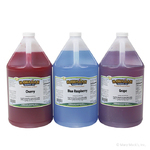 Sangria shaved ice and snow cone syrup is available in both quart and gallon sizes.